Bro. Rene was a Muslim. He grew up with his grandfather who was a sultan and his mother who was a teacher in Arabic. His parents separated when he was young, because his father refused to convert to Islam. In 1995, he worked for Christian fishpond owners as messenger to all the commanders of the rebellious groups in Mindanao. His task was to bring the collections from the fishpond operations. It was during this time that he acquired malaria. His uncle and other relatives who were Muslims were into witchcraft and they could also cure diseases caused by witchcraft using traditional medicine. All kinds of plants and fish that are used for burning were applied to him to cure his malaria, but these all failed. His Christian wife asked permission to bring him to the doctor. But the doctor couldn’t offer any help. He doubted if Bro. Rene could survive the disease. Bro. Rene and his wife returned home without hope of healing. He began to lose appetite to eat. For 3 months, he couldn’t eat well. He stripped off his clothes in public without him being aware of what he was doing. For 3 months, Bro. Rene had not been able to stand. But at that moment, he felt something very cold enter the top of his head and bathe his whole being and he was able to stand strong on his own two feet! He cried out, “There is a God who loves all people!” He received complete healing from his malaria. Bro. Rene searched for Jesus Miracle Crusade International Ministry in Zamboanga but with a mixture of fear because Muslims are not supposed to believe in the name of Jesus. He found the outreach and he was baptized in water in Jesus’ name. For fear of their Muslim community, his wife ran away to Manila. Before long, Bro. Rene followed her for fear that his relatives would kill him for converting to Christianity. For 6 years, they lived in Manila and attended worship services in Jesus Miracle Crusade International Ministry. But in 2000, after the beloved Pastor Wilde Almeda and the 12 prayer warriors went to the camp of Abu Sayyaf in Talipao, Jolo, Sulu and came down safe and unharmed, he realized there was nothing to fear after all. His faith was strengthened all the more and he declared that there is a God who saves and delivers! That the God of Jesus Miracle Crusade International Ministry is the one true living God! He traveled back home to Zamboanga and looked for his uncles whom he greatly feared. He found one of them, a sultan, who had been bedridden for 7 years. Bro. Rene told him, “Uncle, this is your opportunity to know that the God of the Christians and Muslims is one!” And he proceeded to testify that JMCIM brethren fast for 30 days or more and live, unlike their practice of fasting. They make night day and day night. They fast during the day time but eat during the night. His uncle replied, “Son, I receive your Jesus. Baptize me now in His name!” After baptism, his uncle was able to stand up and walk. He shouted, “It is true that Jesus is the only Almighty God!” They organized a Bible Study inside the Muslim community. All fears were vanished because they had proven that God loves all people including the Muslims. Bro. Rene’s mother hurried to the room in fear and begged God in prayer. She said, “Lord Jesus, show to them that You are God who is almighty and all-powerful!” She then lifted the dead child and cried out, “Lord Jesus, prove to them all that You are the God of Christians and Muslims! Please, make this child live!” The child gulped the breath of life and he lived in Jesus’ name! One of his uncles who was a sultan in one of the Muslim towns came to him. He was already blind. He said to Bro. Rene, “Son, I heard that you have become a member of Jesus Miracle Crusade International Ministry. I have also heard how good your God is.” And he told Bro. Rene of how God had miraculously delivered the beloved pastor and the 12 prayer warriors who only carried Bibles from the hands of the Abu Sayyaf. He believed that the beloved pastor Wilde Almeda is a true prophet of God. This uncle, too, received the Lord Jesus and was baptized in water in His name. When he came out of the water, he could see! All glory, honor, praise, and thanksgiving belong to our Lord God Almighty – our dearest Jesus! Bro. 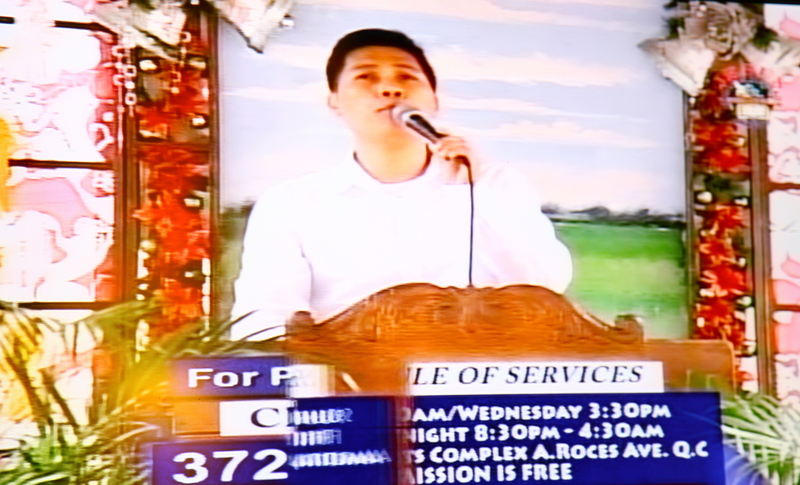 Rommel Domantay testifying in the pulpit, December, 2013, Amoranto Stadium, Quezon City, Phils. Bro. Rommel Domantay was saved years ago through the healing and salvation of her beloved mother who was suffering from kidney disease. Their family had spent a lot on numerous hospitalizations and medications for his mother hoping she would be cured. But they were disappointed; they did not receive the healing that they were looking for. One day, a sounding team for a spiritual and healing crusade by the JESUS MIRACLE CRUSADE INTERNATIONAL MINISTRY passed by their place in Pangasinan. They were invited to the crusade and Bro. Rommel’s mother was more than eager to go. As soon as his mother entered the gate to the crusade, she felt like she was doused all over with very cold water. They told her it was the presence of the Holy Spirit welcoming her. During that crusade, Bro. 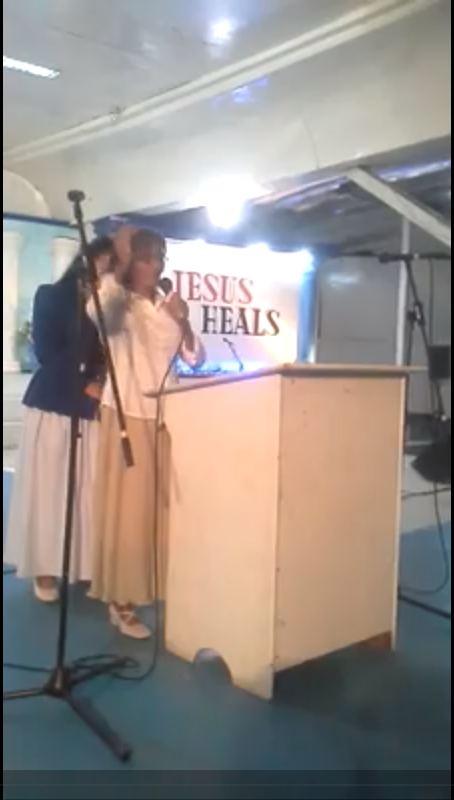 Rommel’s ailing mother received healing instantly and miraculously in the name of Jesus! Then two years ago, Bro. Rommel himself fell ill. He was diagnosed to have gallbladder stones. He lost his appetite and began to lose weight. When he had gallbladder attack, he writhed in pain and was unable to eat or drink. Three hospitals and three specialists that he went to pronounced the same finding and opinion: Bro. Rommel needed an immediate surgery. He had three large gallstones and they had scattered in his gallbladder. Bro. Rommel was desperate but he held on to his faith that the Lord Jesus Christ would heal him, just as he had witnessed her beloved mother miraculously healed. He went to the fasting house to offer prayer with fasting. While there, he was counselled by a preacher to extend his fasting to 10 days. By the grace of God, Bro. Rommel submitted himself to 10-day fasting, and at the end of it, he received the healing he desperately sought for. His gallstones dissolved and disappeared miraculously without surgery or medication. The power of prayer with fasting has not waned through the ages. Even in this ultra-modern world, when a Christ believer and follower in JMCIM has a strong faith to be healed in Jesus’ name and through the prayers of the beloved Hon. Pastor Wilde Almeda – he or she will receive the healing he or she seeks for! For more information on Jesus Miracle Crusade International Ministry, click here. To watch live webcast of worship services on Sundays and Friday overnight with replays on weekdays, click here. For prayer and counselling, call (632) 4193019. Sis. Elizabeth Martines testifying in Pampanga Fasting House chapel, Oct. 2013. I begin to write this amazing testimony of a sister in Christ trying to choke back tears. Sis. Elizabeth Martines has traveled from Cebu to share her blessed testimony during the Friday overnight prayer meeting at the Central Church in Amoranto last week (Oct. 3). On the night of August 16, 2013, Sis. Elizabeth was on board the MV St. Thomas Aquinas which was about to dock at the Cebu City port. At around 8 o’clock in the evening, Sis. Elizabeth looked out to sea and noticed how tranquil it was. The water was clear and she could feel her eager anticipation as in just a few minutes they would be docking. The passengers began the bustle of preparing their luggage, stuffing their belongings in bags and gathering them at their feet. Suddenly, they heard a loud banging noise, like an explosion. At first, Sis. Elizabeth thought it was the ship hitting ground. But then she saw another ship, Sulpicio Express Cargo, in front of them. That was when she realized they just had a collision with another ship! Immediately, power went out and everything was dark. Their ship slowly tilted on its side and in just a few minutes, began to sink. The passengers began to scream in fear and ran everywhere in total panic. The captain announced to abandon ship and the crew distributed life vests in haste. When, finally, Sis. Elizabeth found someone to help her get a life vest, the first two cabinets were already empty. On the third and last cabinet, she found a small one for kids. In desperation, she grabbed it and put it on. To her surprise, the kid life vest fitted her! When she was finally ready to go (to where, she didn’t know), all the other passengers seemed to have gone elsewhere, for the place she found herself in, there were no passengers running and there was some kind of light. She held onto an iron bar to steady herself. She saw as the passengers plunged to the dark waters in extreme panic. Some lost limbs in the process. But Sis. Elizabeth continued to hold fast onto the iron bar of the ship. When the ship finally sank to the bottom of the sea, she went with it. At the depths, she cried out, “Hallelujah! Praise the Lord! My dearest Jesus, forgive me! Please save me! Hallelujah! Hallelujah!” Over and over she cried out to the Lord. She had drunk a lot of sea water but to her, it didn’t taste salty at all! Her neck and head ached from shouting to God for help and deliverance. She saw lots of fish beneath the sea and to her great surprise, she could breathe easily! For about 30 minutes she was at the bottom of the sea. She believed the fishes were deafened by her loud praising and praying that they gathered at her feet and lifted her up to the surface. Another miracle! I think about Jonah as I write this most blessed testimony. When she reached the surface, she just floated aimlessly not knowing what to do. She was covered all over by grease from the oil spill. She also drank oil-contaminated water and this made her weak. She saw lifeless bodies blackened by grease floating around her. It was still after a few hours that they were finally rescued. Sis. Elizabeth didn’t sustain any wounds or bruises from the tragedy. The Lord Jesus Christ delivered her safe and sound. To read news about this sea tragedy, click here.